Are you wanting an energy boost, need an assist in grounding, looking for a manifesting tool, or something else? Whatever your purpose there is a healing stone for you. Shown in this slideshow are the most common healing properties found in crystals. No gemstone has a singular purpose, multiple healing qualities are housed within a single stone. However, some stones have earned a reputation to be especially helpful in certain areas. You could consider these stones healing specialists! The crystals and gemstones that are attributed to the spiritual properties given here are a sampling to help you in choosing the best stones for your purposes. We can all use an energy boost from time to time. Choosing an energizing stone is a great way to help you get through the tough times. Energizer type healing crystals tend to be very powerful because of their higher vibrations so you may need to use them sparingly. But, they can be miracle workers when you are feeling fatigued or weakened. You could temper them a bit if wrapped in a gold setting. Also, you might want to keep these highly-charged gemstones away from your bedside so you can get a good night's rest. Everyone needs solid ground to stand upon. Grounding stones help the lofty individual keep from floating away into the ethers and becoming forgetful or getting lost. A powerful grounding stone can help root you to one place and yet at the same time bring your awareness to a heightened level. Don't worry, a grounding stone won't weigh you down, it is meant to stabilize your energy. Crystals that carry manifesting powers are very magical. They can help you focus on those things you truly want. These healing crystals can also assist you in getting and maintaining a positive mindset. These are the crystals that can be used in your meditation practice to help you focus and assist you when attempting to connect with the your power source, the angels, the akashic records, or with the extraterrestrials. Stones are ancient and wise. In general, they are excellent memory keepers. Certain stones are better at absorbing and retaining information than others. I have found that red-colored stones are especially good at holding onto information. 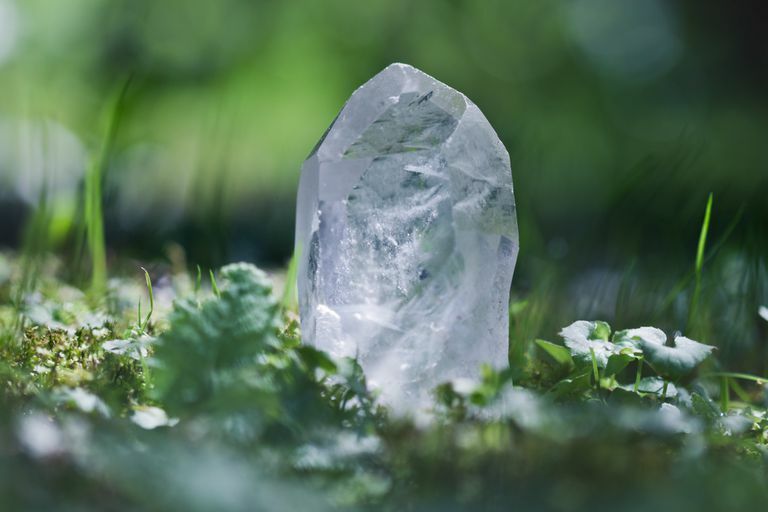 Melody, author of Love is in the Earth, identifies record keeper crystals as having one or more raised triangles located on the face of the crystal. Keep a memory-keeper stone with you while attending classes if you are a student. The stone will not only take notes, but will help you stay grounded and be focused on the lecture being given. Don't forget to carry your memory-keeper in your pocket on exam days. Crystals can be employed as energy shields or work as protective amulets. Actually, shielding stones work best when they are worn or carried on the person. Because of the absorption qualities, many of them have it is important to learn how to cleanse your crystals in order to free them from all negative energies they have picked up. Absorption is often how they protect you, they take in and bad vibrations that are lingering about so you don't have to. The so-called love stones generally carry warm and soft energies. Odd, how they can just land in your lap right when you need them. They can help you attract love and also assist in learning how to love yourself or become more compassionate with others. Perhaps best known as "seeker stones" these stones can help you elevate to higher energetic vibrations, connect with your higher self, and attain knowledge from the astral plane and beyond. These are the stones you can turn to for deeper level healing when your suffering is bordering despair or sadness. They can help uplift you from a "rock bottom" status. You don't have to be a female to request healing energies from stones that carry feminine energies. Every person is a blending of masculine and feminine aspects. These stones are effective in offering healing to the emotional body and also helps to soften any hardened or difficult situations you are struggling with.